Madeline Spohr’s memorial service started at 2:30 p.m. Pacific time today. 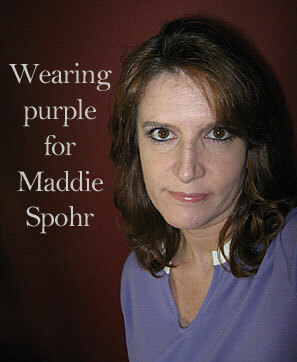 The whole blog-o-sphere is praying for the Spohrs and remembering Maddie. Updated: Mike and Heather Spohr’s loving tribute to their daughter. I can barely type this through the tears. Yes, I listen to Dr. Laura. No, I don’t listen to her every day. No, I don’t make Jazz listen with me. I have it turned on while I’m cooking dinner and I’ve found Jazz, on more than one occasion, “hanging” out around the radio and listening to what she says. He’s curious, and that’s healthy. And yes, I get just as impatient with her as the rest of you. In fact, I wrote a disclaimer about the reasons I feel compelled to talk (validate) Dr. Laura on my blog. I like what the woman has to say. I’m not always crazy with the WAY she chooses to go about saying it, but overall, I think people need to listen, and learn, from the woman. People often miss Dr. Laura’s point – it’s not about Dr. Laura’s methods, or her arrogance, or her theatrics, it’s about what she has to SAY that’s important. 1. I hope it will teach him the importance of choosing a girlfriend / mate. 2. It opens a doorway for discussions about relationships in general. 3. It’s a learning opportunity to talk about the excuses and reasons people give to avoid their own responsibility for a given situation – that it’s important to be honest with oneself. Easter Sunday, I’m catching up with family. I’ve learned that one of my nephews has a new girlfriend (or is it his FIRST girlfriend? It’s a big foggy). My SIL is quite pleased with his choice. But she told me that there were several other girls in his past that she thought would have made a fine match for her son. Only, my nephew wasn’t interested in them. Why? Because they didn’t meet his criteria. Have I mentioned this is the nephew who self-taught himself how to make flash websites and went on to nab a high-paying website designer job, without going to college (a topic for another post) and is now making more money than is normal for a 21-year old boy? Yeah, the kid is smart. Not just in his career choice, but in his relationships, too. I have no idea what his list of criteria is, and frankly, it’s none of my business, but the fact that he has a list at all impressed me. Hearing about his new girlfriend, and a few things that attracted her to him in the first place got me thinking about my own boys … and what exactly, if anything, do they want in a future girlfriend / mate? I’m sure they haven’t thought about it at this point (or if they have, I certainly don’t know anything about it), but it’s something I HOPE they seriously think about – soon. Making out a list of charasteristics sounds a bit dry when it comes to something so … romantic, but let’s be realistic, when the shine of romance wears off, what’s left? Well let’s hope there is enough common ground to keep the relationship going. And just to put this out there, I have no intentions of encouraging my boys to only “seriously” date. I think they should date several women (not at once!) and play the field – experiment with different types of women, sample the various feminine wares and THEN decide what they want. After all, that’s the reason behind dating, right? But along with those experiences, I think it’s a good idea to have a list of core requirements. Relationships are hard enough without the added strain of disagreements on life fundamentals. I had that list of criteria, I just wasn’t consciously aware of it at the time. 1. Same religious beliefs. (Which was pretty open-ended at that time period in my life. I knew I didn’t want to belong to a denomination, but at the same time, the man I chose HAD to believe, and respect, God). 3. Sexual chemistry. (I plan on devoting another post to this very topic). 4. A sense of humor and a willingness to laugh at oneself from time to time. 5. Selflessness – not afraid to give more than take. 6. Must be courteous. It’s hard to respect an indivdiual when that individual doesn’t take other people into account. 7. Must be smart AND have common sense. Being (consistently) flaky is a HUGE turn off for me. 8. Must have a positive outlook on life. The NUMBER ONE way to get on my nerves in 0.2 seconds? Be doom and gloom and/or feel (consistently) sorry for oneself. Hate that. 9. Must have goals – both short-term, and long-term, a real go-getter. 10. Must be compassionate. There is a time to be stubborn and hard-nosed, and there’s a time NOT to be. I plan on sharing my list with my boys. I don’t, however, expect them to have the same criteria. They are their own individuals and they won’t really know what they want until they start dating, but core expectations, from the starting gate, is probably wise. only, I’m sort of not. THAT is the criteria I’ve tentatively set out for myself when it comes to accepting a potential daughter-in-law, but please, I’m not SO inflexible that I will refuse to like a person simply because she doesn’t fit my particular mold. No, I just mean that is the criteria I hope to have in a future daughter-in-law – I will make an honest, and heartfelt attempt to get along with any personality that my boys bring home. After all, she is the one my son wants. She is the one my son has decided he can live with. What I want, or think, doesn’t really matter. But for now, at this moment in their lives, when they are on the threshold of becoming romantically involved with a girl, I think it’s important to teach them that it’s not only okay to have a list of criteria, it’s probably a good idea. It’s important to find a woman who will complement him, not complete him. Here is the video that got me thinking about this topic today. Be patient, he’s sort of brown-nosing Dr. Laura (what do you expect, he works for her), but what caught my attention was what this young man learned, about himself, and about relationships. This got me to thinking about what sorts of things my boys are learning about relationships in general. And I’m hoping they will be as willing to be as honest with themselves as this young man is with himself. Only in OUR dreams, babe. Updated: The number one complaint my husband has with my blog? Of course not, I ramble, that’s what I do. But I thought I’d play along (hence this silly post) to see what he would say. I caught him staring at the photo today, but he had no clue it was my face plastered to this body until I pointed it out to him. (How can it not be obvious? Look at my pasty white face when compared to the rest of this tanned beauty!). I think this is proof positive that men? Don’t even NOTICE the face when they see a hot body.